The first time I saw Synodontis longirostris, I was standing next to a man with a parrot on his shoulder. Back then, I had just taken the somewhat rebellious step of getting one ear pierced and was distracted by the thought that said bird was about to remove what had been recently put in it. Until, that was, I saw this bold-featured catfish for the first time. At that time I was learning about being a young man: this mostly involved very loud and murky rock music, fascinatingly illogical girls, and quite a lot of books about science fiction and hobbits. I had also just discovered hot curries. At the same time all of that was going on I was seeing many species of catfish for the first time. Everything, it seemed, was amazing. I’m now in my forties and it is only in the past few months that it has really become clear to me that it was because fish —especially catfish — were also a keen interest of mine in these early teen years that they became etched in my psyche. This is why I still hold them dear. This is why they hold a fascination to me. This is why PlanetCatfish.com happened. There is certainly a lot to learn about the thousands of species out there, a life’s learning a least: I am glad to have started when I did. But back to the man and the parrot. He (the man) owned a fish store in Edinburgh’s West Richmond Street, an area known as South Bridge. I think it’s the red shop in this Google street view but it was one of several good fish stores in Edinburgh at that time that stocked some pretty cool fish — even by more recent standards. 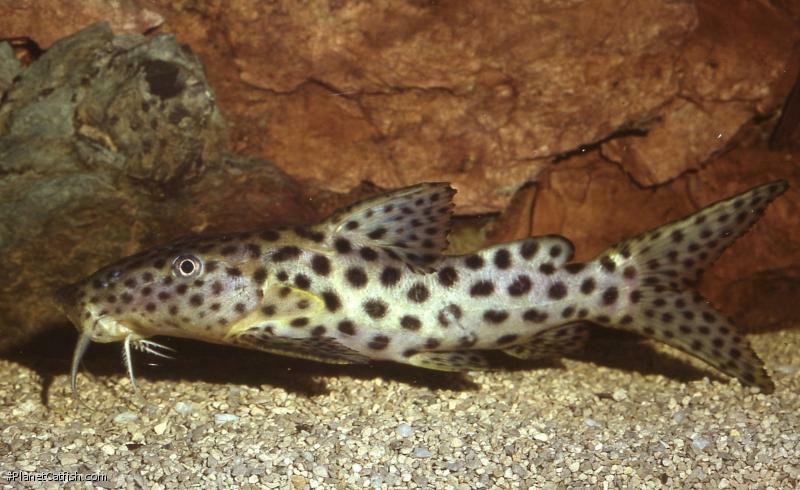 Of one stand-out species were the three or four Synodontis longirostris I saw for sale in the shop. These were good-sized fish at between four to six inches SL (10-15cm) and stocky but graceful Synos. They did not swim upside-down at all and were active feeders. I watched them feed several times and was struck by their large round mouths. The way they eat reminds me more of a large pleco in the way that they hoovered around the substrate (but not coming to rest, not “stuck on” like a pleco). This then is an elegant, flowing fish with large, clownish, dark spots on a blue-grey body. These spots and stylish, long, low looks extend onto a deeply forked caudal fin that sports short extensions. It has a wide and obvious butter-knife humeral process and muscular-looking head, combined with a pleasantly rounded and fleshy adipose fin — it just looks like a really sporty catfish. Over the years, imports of this species have been sporadic, despite it’s being apparently common in the wild. It is likely that the unstable political (and thus trading) conditions surrounding its home in central Africa’s Congo River are at least in part behind this. It’s the kind of fish one sets up a tank around and, while I’ve not kept this species, it would seem hard to think of a setup with medium-sized fishes it wouldn’t be suited for. From what I saw, it would appreciate large swimming spaces and some pipes or shaded areas to rest. It will eat pretty much any prepared food and will compete well for it. S. longirostris is a long-lived species, and one that remains on many catfish enthusiasts’ wish lists, despite the fact it would inhabit a tank for a decade or two. While it is a larger Synodontis species, even at its maximum size it remains manageable and an impressive sight to boot. But it is not nostalgia that makes me wish to see this species again. It is the unusual shape and character of this Synodontis that keeps it, for me at least, high on my species “bucket-list”.